I thought about what to say here for a long time because… everything I want to say about the content of the song is already in the lyrics and really requires no explanation. So I figured maybe you’d like to hear how this song came about. Diane Bastian, who has since retired as Church Music Chairman, called with an assignment. A song about the temple for young women. That may seem like a simple thing, but as it turned out, it was mightily complicated. I have never had another song undergo such scrutiny. I set to work, and believe me, I prayed over this one like nobody’s business. The basic words and melody came quickly, which surprised me. I promptly thanked Heavenly Father for his help, and sent off the rough draft, feeling pretty good about things. And Heavenly Father was sitting up there with a smile on His face, because He knew what was coming. The Music Committee said, “Thank you very much,” and took it to the YW Board who promptly sent it back to me asking for a few changes. It was written from the point of view of someone inside the temple looking out. They needed it written from the perspective of someone looking towards the temple. I only thought it; I didn’t say it, however sorely I was tempted. Eventually it was “done” and I sent it back. And again Heavenly Father was smiling–kindly I think, but very knowingly. The Music committee said, “Thank you very much,” and took it to the Correlation Committee–the body that approves Church curriculum and other such things. They promptly sent it back asking for a few changes. Again I hammered it into the desired shape and returned it. The Music committee said, “Thank you very much,” and took it to the Quorum of the Twelve Apostles. They actually spent time in a Quorum meeting discussing the lyrics to my poor little song. Talk about intimidating. They sent it back, asking for more changes. Some of them even had specific suggestions. One of them was reminded by the others that his suggestion had 7 syllables and we had only 5 to work with… So I hammered it again, and sent it back. Whew. It was a wilder ride than I anticipated, but in the end the song was exactly what it was supposed to be. As a fitting, full-circle sort of end to the story, the demo recording below is sung by Katie Bastian, Diane’s daughter, who is now an amazing Church Music Manager (the titles keep changing) as was her mother before her. Appeared in the March 2002 New Era Magazine. Lyrics to this song were read at the dedication of the Nauvoo, IL temple. Tks for your lyrics. We are using It in conference in Engenho de Dentro Rio de Janeiro Stake. I want to thank you so much for your talent. I have used many of your pieces in Firesides and other church meetings. This is one of my favorites. I will be singing it at a singles fireside this Sunday the 24th of July. 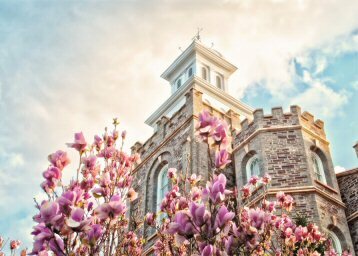 The topic is the Logan Temple and the history of it. I feel there isn’t another piece of music that fits this as much as this beautiful arrangement. I love that you have written pieces for lower voices your arrangements fit perfect with my mezzo voice. We just wanted to thank you for this beautiful song. The young women sang it in our ward today and it was so lovely. I feel like the girls have really internalised the message we love it! Thank you so much for blessing us with your talents! I really enjoy your music. I was particularly impressed with your song “In That Holy Place”. I heard it sung at the General Young Women’s Meeting (yes, some men listen to those broadcasts as well). I wanted to thank this web site and especially Ms. Sally DeFord for her generous sharing of her music for our Church use. Yesterday, our Young Men and Young Women sang In That Holy Place in our Sacrament Meeting after spending Saturday morning serving in the San Antonio Temple participating in baptisms. Performing your music was a perfect ending to our spiritual exercise. To be able to have this wonderful music to help our youth learn through practicing the song before our temple visit and then performing in Sacrament Meeting was a small way to slip in an extra bit of spiritual feeding. Music is so important to help us learn and feel the Holy Spirit. Truly pure learning and teaching comes through music and the Spirit. Your talent benefitted our youth’s testimonies and our Ward Members in general. I have used a number of your pieces with my choir and they thoroughly enjoy singing them. Yesterday our morning service was broadcast live on BBC radio Ulster and the choir sang ‘In that Holy Place’. I just wanted to thank you and let you know you can listen on the BBC iPlayer at BBC radio Ulster listen again, Morning Service 28th April.